Tulips are packed in 10 stem bunches with an average stem length between 16-18 inches. 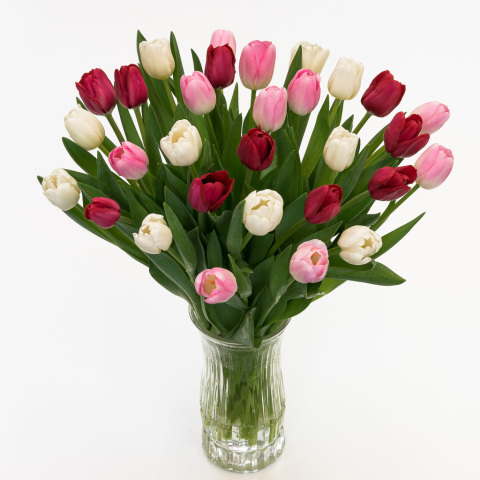 Flowers are picked fresh the day they are shipped, packaged carefully in our Tulips.com box, and delivered overnight. Care instructions are included with every order. Exact varieties may vary from those pictured. Flowers will arrive closed and will take 1-2 days to open fully. Tulips are no longer just a flower for spring. Although we do have 400 acres blooming in our Skagit Valley fields each spring, we also select the biggest tulip bulbs from each year's crop to force in our greenhouses throughout the other months of the year. And because we can control the growing of our flowers from the earliest stages, Tulips.com can also ensure that you will be receiving the most outstanding product available!